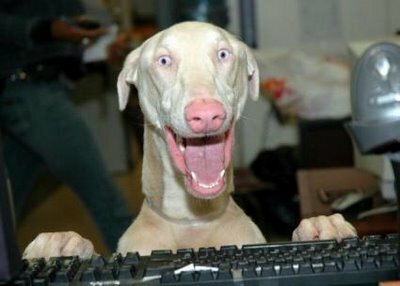 Over recent times I have gained the nickname “Excited Puppy” at work and even been given the picture above by a workmate to represent me. This is because I seem to be amped all the time about the awesome stuff happening at Hobsonville Point Secondary School or whatever the latest book/article/blog I read has taught me. A week ago I wrote Warm and Demanding about how we were working through some challenges at school. That post cleared my mind again and helped me to see that we are going to figure out solutions and reiterate processes based on our vision. Since then I have been in a strong “excited puppy” phase again as I have been able to focus on all the great things occurring. Both of my modules are heading off into a more inquiry based phase: Museum of Mihi students after our trip last week are now creating their own exhibitions and Mapping Me students are now answering our big question – What has had the most significant impact on who I am, genetic or social influences? This is exciting because now we are in the more creative phase of learning where students are making their learning paths whilst also getting to create – Museum of Mihi are having an exhibition where the community are invited and Mapping Me will be sharing their understandings with their peers through videos, ted talks or display boards. We have also just started planning the Term 2 modules which are on the concept of Place and Space. This process started with students representing each Learning Hub coming together and providing ideas of what they had done in the past (so we can build on that rather than recover old ground) and what they would really like to learn about. Their ideas were outstanding and prove that they really understand how learning areas overlap. There was very little “I want Science” and lots of authentic interests and passions for us to think about. We also had Learning Area meetings where the teachers met up to discuss the concepts and skills we will focus on covering next term. This means that our first cross-curricular Learning Group Meetings this week will start from a focus on student voice and Learning Area requirements as the launching pad for the creativity of planning our Term 2 modules. It’s also the first proper week of our next Big Project. I am taking a project based on learning with future technologies. To this end, the wonderful people at MindKits have helped me through ordering decisions over the last week. This week we should get a delivery of 4 MaKey MaKey, 4 Arduino Inventors Kits and some different Brainboard Kits (which are their supersized versions of arduino). I have also been organising some guests to come in over the next couple of weeks so we can explore what these technologies are capable of before the students start tinkering with their own inventions! Over the weekend I have also joined up to the Learning Creative Learning online course/community that is being run over the next 2 months by M.I.T Media Lab. This awesome course will help me explore and deepen my creativity and Maker ability. Already I have had offers of help with MaKey MaKey and Scratch from the US plus a chat with an Australian teacher about our school structures. Who wouldn’t be an excited puppy about all this? This entry was posted in Uncategorized and tagged curiosity, Hobsonville Point Secondary School, learning, making, reflection by stevemouldey. Bookmark the permalink.